There’s a dreadful sameness to President Trump’s European trips now. They begin with wishful thinking from commentators: Wouldn’t it be great if this were the trip where Trump stood up to Putin, expressed genuine support for NATO, showed some grasp of 20th-century history, or simply managed not to offend anyone? Then comes the actual trip, with the usual affronts; during his trip to France this past weekend to attend ceremonies marking the 100th anniversary of the end of World War I, President Trump skipped a planned visit to Aisne-Marne American Cemetery and Memorial, citing rainy weather, and then traffic concerns — though Chief of Staff John Kelly and General Joseph Dunford Jr., chairman of the joint chiefs of staff, managed to attend, and the leaders of France, Germany, and Canada showed up at other sites outside Paris to honor fallen soldiers. 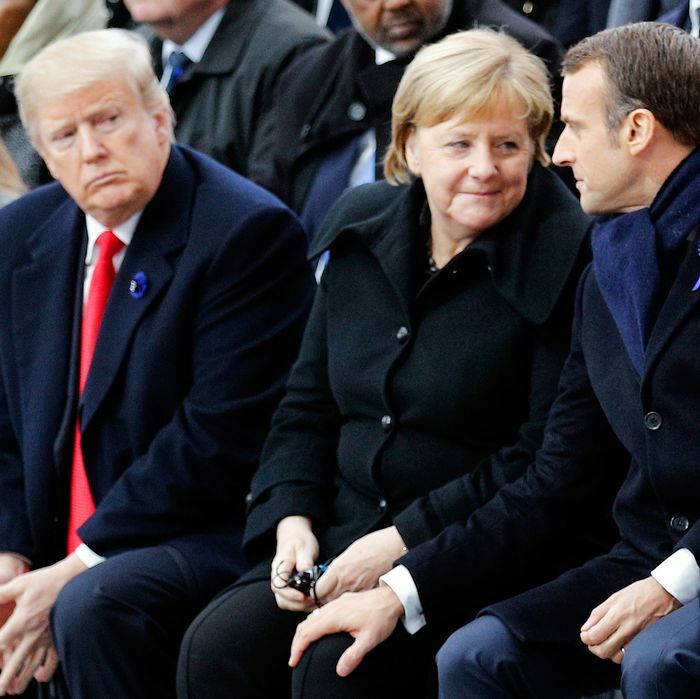 This excursion featured a bonus gaffe, reported by the French paper Le Monde: When Trump first met the leaders of the three Baltic states (that’s Baltic, near the Baltic Sea in northern Europe) he reportedly confused them with the Balkans (that’s Balkan, in southern Europe (an easy enough mistake, but that’s why he has foreign policy advisers, and a smartphone for the Chinese to hack). Trump proceeded to lecture the three leaders, small NATO allies under intense pressure from Moscow, about a conflict that occurred 30 years ago in countries 1,000 miles away. Americans might be tempted to read this as Trump, weakened after the Republicans’ loss of the House of Representatives in last week’s midterm elections, being rebuked by the stronger forces of the liberal order in Europe. But they would be sadly mistaken. Macron would probably love to have Trump’s popularity; his own approval rating stands at just 29 percent, and French commentators are nervously looking over their shoulders at the French far right, which was just defeated by Macron in last year’s presidential election. For all the beauty and emotion of Macron walking the streets of Paris with the leader of France’s World War foe Germany, Angela Merkel is a lame duck — and it is unlikely that her successor will value European and trans-Atlantic unity quite as highly. Even Canadian prime minister Justin Trudeau — who made a point of closing his umbrella during Saturday’s commemorations in what was interpreted as a rebuke to Trump — is falling in popularity, and Canada’s own right wing, helped along by American conservatives, have him in their sights. Then there’s British prime minister Theresa May, who visited France a day early for separate ceremonies with Macron, then spent the weekend at home. It’s a striking commentary that a German leader could observe the centenary the territory of its former opponent, but an English leader opted not mark the occasion on the territory of an ally. In 1914, and again in 1939, the experts were wrong. So do we have any chance of doing better 100 years later? Perhaps. The World War I remembrances were a reminder of just how much carnage can be unleashed due to a few people’s say-so. One in every four British men joined or were conscripted into the military, as were thousands of colonial subjects in Africa and Asia; in some cases, those men fought and died weeks after the armistice, before word reached them to lay down their arms. Estimates put the war’s total number of military and civilian casualties at around 40 million. As Trump comes home, a lame-duck Congress considers whether to press him to end U.S. support for a deadly Saudi war against the people of Yemen; whether to pile yet more sanctions on Iran to egg its hard-liners toward violence; and whether to ratchet up the economic hostilities with China. If his trip reminds even some of our elected officials, whatever their ideologies, of how difficult it is to contain violence once it is loosed, it will not have been in vain.